It has been a difficult Summer and Larry decided we needed a weekend alone. He made a reservation at a lakeside cabin for October 8th and 9th. We arrived at the cabin late in the afternoon. This weekend was unusually warm and beautiful. No mittens or snow pants were needed. Above is the beach of Lake Superior. Below is the 'lawn ornament' built by the owners of the cabin. Lake of the clouds in the Porcupine Mountains panorama. 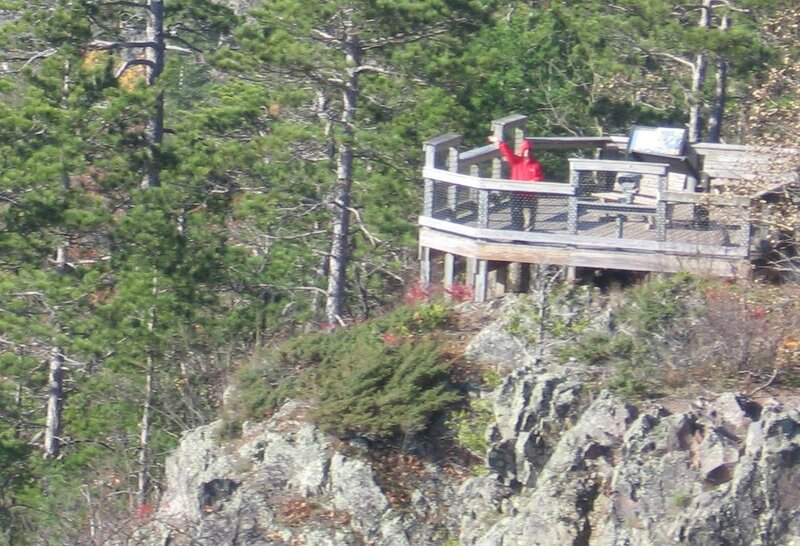 I stayed at a lower observation deck and waved at the adventurous Larry. Below is one of the many waterfalls in the Porcupine Mountains. (Nawadaho falls) Larry rock hopped along the bank to get beautiful pics. This 4 story tower is on top of the 3rd highest point in Michigan. Larry scaled to the top and spun around taking pictures and videos. Back to the beach to end the day with a small beach fire and grilled supper. The waves were active, yet the wind was still out of the South. It was a beautiful night. It was the kind of night stars reach the lake. Larry captured another sunset.